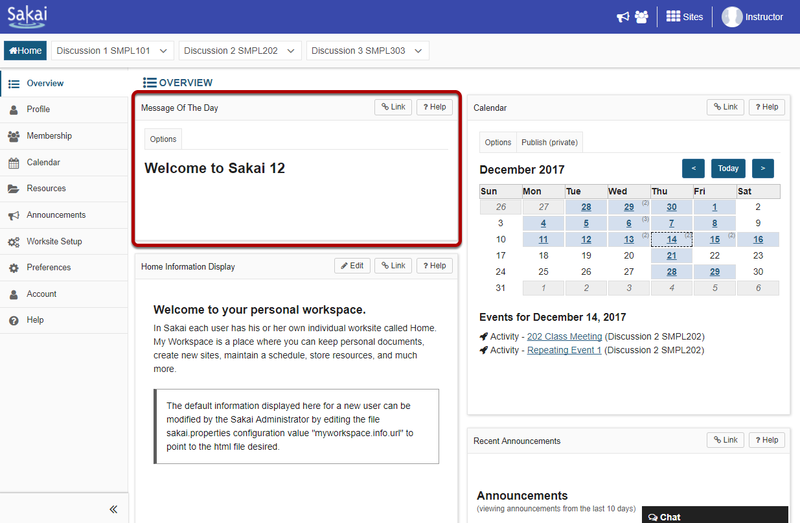 Sakai Guides and DocumentationSakai Complete User Guide HomeWhat is the Home Message of the Day? In the Overview area of Home, you will see announcements from your system administrator under "Message of the Day" (MOTD). The MOTD is typically used for system-wide announcements. Most institutions use this space to display messages about scheduled maintenance, system updates, and important dates and events. You may customize the appearance of the Message of the Day by selecting the Options button. You can choose to view just the subject line or the entire body of the message (default selection) by selecting the appropriate radio button. You may also use the drop-down menu to select to view All, One, or Two lines of the message body. 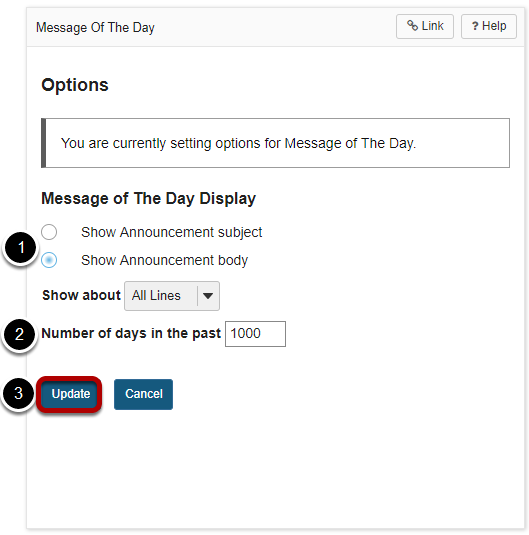 You may also specify how many days in the past messages should be displayed. This is useful if you prefer to only see recently posted messages. If you make any changes to the default options, be sure to click Update to save your settings. Prev: What is the Home Tool Menu? Next: What is the Home Calendar? What is the Commons tool? How do I set permissions in Commons? How do I create a post in Commons? How do I comment/reply to a post in Commons? How do I edit a post in Commons? How do I delete a post in Commons? How do I edit a comment/reply in Commons? How do I delete a comment/reply in Commons? How do I download multiple files from Dropbox? How do I send an Email message? How do I create a new forum? How do I format my file for importing grades into Gradebook? What are the different gradebook scenarios and which one is right for me? How do I set up a simple points-based Gradebook? How do I set up a Gradebook with categories for organization and/or dropping grades? How do I set up a Gradebook with categories and weighting? How do I add forums or topics to a Lessons page? How do I require completion of a Lessons page? How do student add content to Student Pages in Lessons? How do I change the background color of a block? How do I create collapsible sections? How do I add a resources folder on a Lessons page? How do I embed the Calendar on a Lessons page? How do I embed announcements on a Lessons page? How do I embed forums conversations on a Lessons page? How do I add a checklist on a Lessons page? How do I upload content in a zip file on a Lessons page? How do I add an external tool on a Lessons page? How do I enable Lessons subpage navigation in the Tool Menu? How do I assign an "owner" to a Lessons page? How do I view News tool content? How do I edit the Overview site information display? How do I delete a podcast? How do I edit a podcast? How do I edit a podcast feed? How do I edit a poll? How do I reset a poll? How do I remove a poll? How do I update a PostEm feedback item? How do instructors view feedback in PostEm? How do I download a copy of the CSV feedback file? How do I delete a PostEm feedback item? What is the Roster tool? How do I export the roster? How do I edit Roster tool permissions? What is the Search tool? How do I perform a basic search? How do I perform an advanced search? What tool content is included in search? How do I add participants to my site? How do I edit syllabus items? How do I rearrange syllabus items? How do I pubish/unpublish a syllabus item? How do I add a syllabus item to the calendar? How do I change syllabus item access? How do I delete a syllabus item? How do I set up a random question set? How do I edit my assessment title or description? What are the Availability and Submissions options for an assessment? How do I give specific students different time or date settings for an assessment? What are the Grading and Feedback options for an assessment? How do I adjust the layout and appearance of an assessment? How do I duplicate an assessment (i.e. test or quiz)? How do I preview an assessment (i.e. test or quiz)? How do I print an assessment (i.e. test or quiz)? How do I grade assessment submissions by student? How do I grade assessment submissions by question? How do I download Tests & Quizzes submissions for grading offline? How do I give the same score (e.g. 0) to all students with no submission for an assessment? How do I view statistics about a completed assessment? How do I allow a student to retake a test or quiz? What information is in a Tests & Quizzes email notification? How do I create a Web Content link to a folder in Resources?